The two defining world events of the last decade have been 9-11 and the ensuing Iraqi occupation, and the global financial crisis of 2008 – for which the last word has still to be written. Filmmaker Charles Ferguson may have created the definitive documentary film accounts for both – in 2008, No End in Sight provided a damning analysis of the US-Iraqi occupation and subsequent insurgency, and his latest film, Inside Job, takes on the failure of the US financial industry. As he did with No End in Sight, Ferguson provides a well paced and strikingly clear account of the causes and events leading up to 2008, and parades before us a gallery of villains and players (some of whom he interviews, rendering quite uncomfortable under his grilling in the process), most of whom still remain in key decision making positions. You’ll come away with an understanding of how all this happened; anger that while catastrophe has been averted for now, things really haven’t changed; and an insight into the scale of the problem. deregulation leads to an industry where conflict of interest is legalised, and where the capitalist ethos, self-interest and short term gains thrive and are encouraged. One solution appears to be greater regulation to prevent conflicts of interest, but given the power the financial industry currently wields, the chances of this happening any time soon are low. It just fits an iPad, Apple wireless keyboard , and Compass iPad stand . 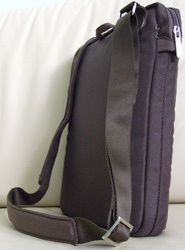 An almost-full length front zip pocket takes a cell phone or iPod Touch, as well as a notebook, and the strap contains a slot for your headphone cable. It’s modestly priced ($25), carries no wasted bulk to capitalize on the iPad’s thin profile, but is also tall enough to take the Apple bluetooth keyboard, something which sets it apart from other bags (I looked at the usual suspects: Timbuk2, Waterfield, Booq, Crumpler and Tom Bihn), and is an ideal transport for the iPad on short trips. It’s made by Tucano, and can be found here . I’ve had an iPad now for three months. In that time, I’ve barely touched my laptop. 1. For content consumption, the form factor is compelling. The book analogy is apt – I hold it like a book, it’s closer to my face and eyes, and it encourages and facilitates sharing with others. 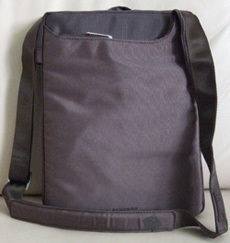 I use it in a much larger range of situations than I would a laptop, and more often – in bed, on the street, at a cafe. It’s tactile – using my fingers to touch and interact and engage with media / content can seem more direct when compared to keyboard and mouse. However, while it facilitates increased consumption, it isn’t always the best tool for efficient consumption – if I have a backlog of Google Reader articles I want to go through, I’ll use the keyboard and mouse on my desktop, which are vastly more efficient still for most tasks. Ironically, it’s given me a greater appreciation of how important the development of the mouse, keyboard and windows-based UIs have been to the overall advance of the computer age. The iPad encourages shallow consumption – if I need to analyze and synthesize information, this usually means flicking between several web pages and applications at the same time, which means my desktop. Pages in Mobile Safari also load more slowly than on my desktop and laptop. The difference is that I can be lying in bed or at a cafe with my iPad, in a relaxed state, and on my terms – that alone is compelling. Native mouse and keyboard support in the OS is really needed if the iPad is to become an efficient content creation tool. I’m creating this post in the WordPress app, but using the Bluetooth keyboard without a mouse is cumbersome and much slower compared to a laptop. 2. Portability – 1.5 pounds, which is just light enough to not have to think about slipping in a bag when going out. It’s still much better than most netbooks or laptops, will only get lighter (and include more features – front and back cameras), and is reasonably robust (a one-piece slab, with flash memory). 3. Instant on, casting the computer as personal information appliance. I took it on a holiday to NYC, and got into the habit of taking it out of my bag, using GPS to quickly figure out which street I was on, and getting directions to my next destination. It removes the time tax on using a computer to get information. 4. Battery life, something less to worry about because the iPad seems to go for days on a single charge. Not true for laptops and cell phones, where I have to remember to plug in every night. 5. Fit-for-use OS. The UI is finger-centric, and you won’t see many carryovers from the mouse and keyboard world, one of my frustrations with Windows Tablet PCs. 6. Unlocked with no contract, for me, the tipping point. I’m able to reactivate my monthly data plan with ATT whenever I want and as I need (if I’m holiday elsewhere in the US, for example), and when I was in Australia, simply slipped in a Micro SIM from Optus to get 3G coverage there. 7. GPS, and location-based apps, which are going to be huge as smartphones continue to become a bigger part of our lives (although I’m still a holdout). Take for example, Zillow, which allows me to see every house for sale overlaid on a map of my current location, along with photos, description, agent contact details, price history, and a price estimate. 8. Many native apps appear to exist to address the fact that a browser web app is not the most effective way to access information on the iPad. However, more websites are being created specifically for iPad use – Yahoo mail and Gmail have particularly good implementations – and this should be a growing trend, as it allows companies to bypass the App Store’s restrictions. 1. Instapaper ($4.99) – One could argue that reading is the iPad’s raison d’être, and Instapaper is the reading app I use the most. It allows for deep reading by presenting downloaded web pages and with all advertising and other site context removed. Every article, no matter where it comes from, is presented the same way – simple text on a page. With many other apps providing Instapaper support, and article recommendation websites (eg. longform.org) built around Instapaper, an ecosystem is developing, which augurs well for folks who appreciate the written word. 2. Feeddler RSS Reader Pro ($4.99) – My second-most used app. I’ve purchased and tried Reeder as well, but in the end, Feeddler best suits the way I browse my feeds – by folder, then by feed. 3. Amazon Kindle (free) – Seems to have a larger range of eBooks than iBooks, and more free books to boot. I’m currently reading The Rational Optimist , which was available free for a limited time – the hardback list price is $26.99. 4. Atomic Web Browser ($0.99) – Addresses a number of Mobile Safari deficiencies: full-screen browsing (which Mobile Safari does not have), multi-tab support with tabs shown onscreen for quick switching, and concurrent loading of multiple pages. 5. Twitter (free) – The UI is different, clean and effective. Along with InstaPaper’s Editor’s Picks, longform.org, and Google Reader, I use it to discover new articles of interest. 6. Friendly ($0.99) – A more iPad-friendly UI on top of Facebook. 7. Skype – For overseas calls – unfortunately, an iPad-native version doesn’t exist yet, and I use the iPhone app. 8. Netflix (free) – If you live in the US, a NetFlix subscription is a no brainer, especially with a an imminent streaming-only option. When I was at home sick earlier this week, I watched The Thin Red Line in HD streaming, propped up in bed, coughing my lungs out. The NetFlix app also supports HDMI-out to your HDTV. Others – ABC Player (current season episodes, in HD), VLC. 9. App Shopper (free) – How I discover the majority of my apps, and my free apps. Others – Wikipanion, Open Table, Zillow, Cool Hunting, Houzz, Kayak, TED, Flixster. 10. GoodReader ($0.99) – A PDF reader which is in the music section because I use it to access my musical scores. The iPad screen is only 10 inches diagonally, and GoodReader distinguishes itself from other PDF readers by allowing you to create custom crops / viewport dimensions for each PDF. This lets you optimize the use of screen real estate and aspect ratio so that all notes on a page are displayed, but zoomed in to their largest possible size. I can see the iPad being a boon to musicians – instead of lugging around a number of books, all your scores are available to you and other collaborators in a drastically lighter package. Others – AccuPlayer, Pandora. The streaming music apps will really come to the fore when Apple releases iOS 4 for the iPad, allowing this apps to play music in the background. 11. NYTimes (free) – A native UI on top of my favorite newspaper, with all current articles available (some opinion pieces are not). 12. ScoreCenter XL (free) – A native UI on top of ESPN; video highlights are available on the same page as the game recap. 13. WunderMap (free) – A map of your current location overlaid with temperature readings from weather stations in the area, and forecast information. Lightweight and ad-free, compared to some of the other weather apps, which are ad-heavy. 14. World Clock (free) – Includes a world map with areas of daylight and night. 15. Office2 HD ($7.99) – A number of document editing apps exist, but this one appears to have the most seamless integration with Google Docs. When you edit a doc and save it, it uploads it directly back to Google Docs – some other apps I’ve seen force you to download the file locally, and then manually re-upload it (where it then gets saved as a new Google Doc). Games – Tap Tap Revolution, Stick Golf, Angry Birds Halloween ($1.99). The most surprising thing about this film for me – in Charles Ferguson’s narrative, how seemingly clear and direct the causes were for the current tragedy that is Iraq – egregious, depressingly mundane, and avoidable. The initial post-invasion goodwill was rapidly, almost systematically dismantled and destroyed, creating an environment for insurgency. The mistakes made provide learnings which can also be applied to any undertaking where a number of people are involved, and planning is needed. Insufficient (and bad) planning. An example: martial law was not immediately established, with no good reason for this other than senior leadership thinking it wasn’t necessary. This left a void for law, order and security, which was quickly filled by religious extremist groups. Advice of experts and people on the ground was ignored. During the planning stage, General Shinseki’s recommended number of troops for the occupation was questioned and dismissed, even though he had direct and recent experience with post-war occupation – and he was later proven right. People were not treated with dignity. The Iraqi army was dismissed, as well as the incumbent government, completely disregarding people’s basic needs – an opportunity to make a living with respect and dignity. The Green Zone post-invasion immediately created a clear “us and them” environment. Insufficient communication, both within senior leadership and through the entire organization, and among the key leaders, a general lack of critical thinking and thoughtfulness. No desire to seek out differing opinions, or speak with others to build consensus and buy-in. Not toeing the company line meant being removed from your position, eventually resulting in an organization of yes men – nepotism in government.